You’ve heard the phrase, “out with the old, in with the new,” yet your love for vintage style disagrees. Finding common ground between two eras can be challenging, but don’t let that scare you away from an eclectic style you’re bound to enjoy. Before bringing an item into your space, decide what role it will play in the grand scheme. Will the piece become a focal point, or will it simply complement other elements of the room? Just like your favorite movie, your space needs a strong cast of main characters that pop and supporting roles that blend. To create a cohesive design, you need a good combination of vintage and modern, and a few transitional pieces to bridge the gap between styles. Ignore the labels. 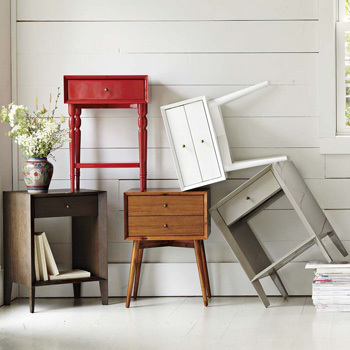 Just because the tag reads “vintage” or “modern” doesn’t mean the piece is right for your room — and if you’re not careful, you’ll wind up with a hodge-podge collection. Instead, trust your eyes and your heart. Look for pieces that remain true to their styles and speak to your individual preferences. When merging two contrasting styles, creating balance is critical. Just remember one word: contrast. Pair a vintage dresser with modern vases. Place pillows with modern fabrics on an old-fashioned sofa, or use a vintage lamp on a lacquer side table. To simplify this process, identify the style of the largest item in the grouping, and then use contrast for the accessory items. Balance can also be created through color, scale, pattern, texture and line. To make the space your own, combine these elements in unexpected ways. Find items that are unified through these elements to create appealing displays throughout the room. If you find yourself stuck between the old and the new, try out a few pieces that feature both vintage and modern characteristics. Rely on the classic look of mid-century design to find a middle ground. Furniture pieces within this style combine the classic, handmade feel of vintage pieces with the simple, clean lines of modern design. It’s the best of both worlds! Thrift stores and second-hand shops are great places to find great deals on mid-century furniture, and many modern retailers are introducing lines of their own. The mid-century nightstand collection at West Elm offers several styles and colors at a price that won’t break the bank.